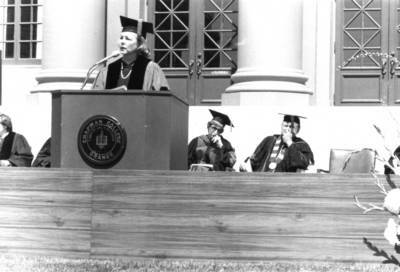 "Marjorie Downing Wagner, Chapman commencement speaker, 1975"
Commencement ceremony held in front of Memorial Hall, Chapman College, May 25, 1975. Marjorie Downing Wagner, the commencement speaker is at the podium. She also received an honorary Doctor of Laws degree. Alice Flint and President Donald C. Kleckner are seated behind her. BW photographs; 4.5" x 6.5"